Home Differences What is the Difference Between Tangible and Intangible Assets? The best way to remember tangible assets is to remember the meaning of the word “Tangible” which means something that can be felt with the sense of touch. Assets which have a physical existence and can be touched and felt are called Tangible Assets. The main difference between tangible and intangible assets is where one can be touched and felt the other only exists on paper. Tangible assets can include both fixed and current assets. Few examples of such assets include furniture, stock, computers, buildings, machines, etc. The opposite of Tangible Assets, Intangible Assets don’t have a physical existence and cannot be touched or felt. 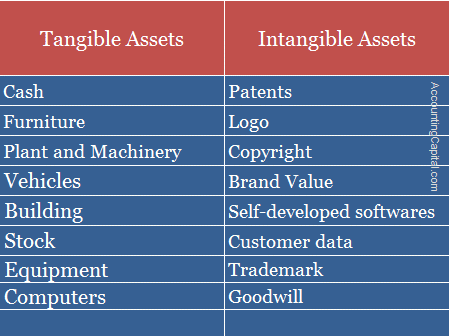 Intangible assets can either be definite or indefinite, depending on the kind of an asset in question. A few examples of such assets include goodwill, patent, copyright, trademark, company’s brand name, etc. A patent is a definite intangible asset as it will expire after the patent is over, however, a company’s brand name will remain over the course of the company’s existence. 1. They have a physical existence. 1. They don’t have a physical existence. 2. Tangible assets are depreciated. 2. Intangible assets are amortized. 3. Are generally much easier to liquidate due to their physical presence. 3. Are not that easy to liquidate and sell in the market. 4. The cost can be easily determined or evaluated. 4. The cost is much harder to determine for Intangible assets. 5. Examples: vehicle, plant & machinery, etc. 5. Examples: Software, logo, patent, etc. >Read What are Contingent Assets?